I've always wanted to be a food blogger because it combines my two favorite things: food and writing. I even went so far as to sign up as a food blogger from some offer on Craigslist. Shocker that one didn't work out. But I'm not taking no for an answer, so here's my first food review. In celebration of the first week of fall, it's pumpkin flavored. 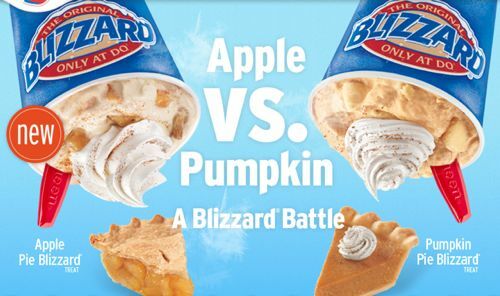 I'm reviewing Dairy Queen's Pumpkin Pie Blizzard. The crust tasted like, shaped like, looked like, and probably were oyster crackers. And the pumpkin pie filling tasted like (if I had to guess), looked like, and had the exact same consistency of pumpkin baby food. So pause while you picture those two elements, wrapped up in some melty vanilla ice cream. Then, add in the excessively sour taste of the baby food, coupled with the stale cracker crust, and it's just a depressing combination of food. The worst part of the whole experience was that this isn't even what I wanted. They had run out of cookie dough. And they ran out of chocolate ice cream the previous time. I have been trying pumpkin everything lately, except for the fact that everywhere runs out of it. I went to Dunkin Donuts and they ran out of pumpkin flavoring for coffee. Then I went to Starbucks and they ran out of pumpkin scones. So by the time I make it to Dairy Queen and they actually have pumpkin flavored foods, and it's terrible. But let's be honest, this set-back won't stop me on the quest for pumpkin flavored everything this autumn.